Hi, I am trying to make a quilt with a picture of piano in the center. Here is the drawing of it. I am debating how to do it. 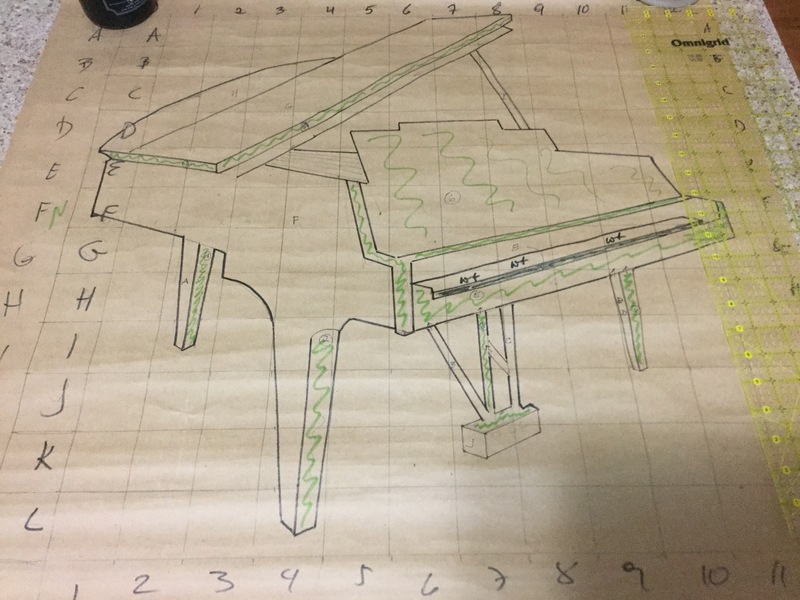 Should I do it as a appliqué, some pieces will be quite large (the piano center will be about 25 inches square) and how will I join these pieces? or, should I try to divide this drawing into section and attempt to paper piecing? I will be using a black batik fabric, as it frays less and if I do appliqué I will use 'wonder under' only as a outline. I know that this forum has so many very experienced quilters and I thought that I will ask for advice. If it were mine to do, I'd do applique. I would applique it and maybe use a dark grey color for the pieces shaded in green for contrast. can you take it to a copy center and get them to blow it up to the size you want? that is what I would do. Most commercial copy centers will not enlarge a copyrighted pattern. They feel it violates copyright. I had a pattern that *required* copying, because it was printed on both sides of the paper and cutting from one side would have destroyed the pieces on the other side. The copy center refused to do it. Great pattern. I take patterns to our copy center (FED-EX) and copy or enlarge all the time. They have no objections if you make the copies. I used to have dh enlarge/copy all my patterns when he worked for big name image companies. Now I use blueprint shops or most often- staples or office depot/max. Have never had them refuse to do that for me. Didn't matter if there was a size change or not. I prefer to keep my originals intact in case I want to do the pattern again in future. Considering that some patterns are over $50. (pretty pricy when you think about it) I won't take the chance of using the original only & then having a major mess up!!! Go to a different copy shop!!!!! I drew an Arkansas Razorback and enlarged it to do an embroidered whole-cloth quilt as a wedding gift several years ago. I took my drawing and had it enlarged at Staples -- no problem. Of course, the prime difference here is that it was a drawing that I drew (and it took me months to get it right since I was working full-time). I had a request from a member here a few years later and I took the drawing back to Staples and got another copy made to send to her. I've also taken surveys (certified copies) to the blueprint shop to have copies made -- no problem.